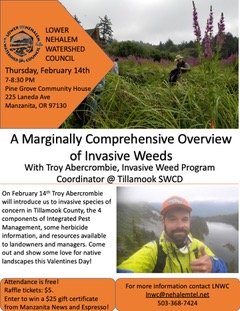 This event is part of the Lower Nehalem Watershed Council’s regular Speaker Series. Join us at the Pine Grove Community House each 2nd Thursday in January through May, October and November for natural resource focused presentations. We raffle off a gift certificate or special item from a local business supporter during each event. This month we have a $25 gift certificate from Manzanita News and Espresso. Raffle tickets will be available for a $5 donation at the door and the winner will be drawn at the end of the presentation. Swing into Manzanita News and Espresso at 500 Laneda Ave. to check out their goods and join Lower Nehalem Watershed Council on February 14th for a chance to win this great prize! “I ♥ The Nehalem River” bumper stickers will also be available by donation.